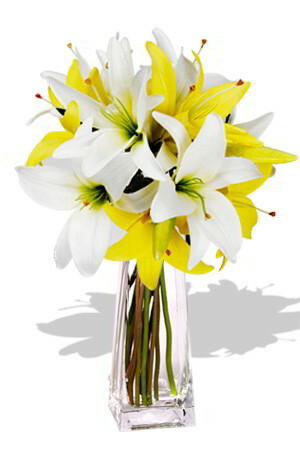 This magical bouquet of yellow and white Asiatic Lilies are truly enchanting. 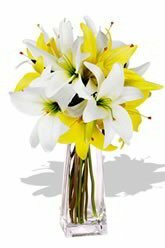 The meaning of Fay is fairy and anyone and everyone will surely feel uplifted and soar with delight at the sight of these glorious blooms.Lilies may be sent closed/partially closed in order to prevent damage and to last longerVase not included however; to make a serious impression on your loved ones, we recommend a Premium Vase to complement these Lilies perfectly. The flowers and vase were delivered on time and in excellent condition. I will be using this site again.